The Historic Preservation Commission reviews and recommends historic designation of applicable sites to the Board of Town Commissioners for designation by Resolution. The commission also reviews proposed plans for renovation, additions or demolition of designated historic sites to assure protection of these historic resources. For an application for submission to the Historic Preservation Commission to request review of your property, click here for the application and here for the procedures/process instructions. The Commission meets on the fourth Thursday of every month, 6:00 at Town Hall located at 39 N. Hickory Avenue, provided action is required. The primary focus of the commission is to protect historically significant town structures and to generate interest and understanding in the town's history and its buildings. 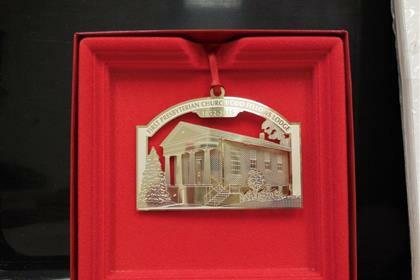 2018 Christmas Ornament "Court House"
2017 Christmas Ornament "Bel Air Station"
2016 Christmas Ornament "Harford National Bank / Masonic Temple"
2015 Christmas Ornament "First Presbyterian Church / Odd Fellows Hall"